Step into the herbarium at Rancho Santa Ana Botanic Garden (RSA) and you step into a world rich with history. This herbarium contains an impressive 1.1 million specimens. The collection is comprised of mostly vascular plants. Ancillary collections include 3,000 pickled cacti, seeds, pine cones, and a small collection of lichens. Of the more than one million specimens, it is estimated 600,000 are from southern California. What is an herbarium and what happens in an herbarium? An herbarium is a collection of plant specimens that have been pressed, dried, and mounted onto archival sheets of paper. An herbarium sheet is comprised of a pressed specimen and a label containing collection information, such as the name of the plant, the name of the collector, and location information. Often times, there will also be seed envelopes and fragment folders on an herbarium sheet. Seed envelopes hold loose seeds and fragment folders hold bits that may have broken off the mounted specimen or they may hold some other material the collecting botanist deemed to be important. Mounting pressed plant specimens onto herbarium sheets is a never-ending task at any herbarium. At RSA, herbarium staff and dedicated volunteers spend countless hours mounting plants onto herbarium sheets. Each morning volunteers go to the herbarium’s workroom to mount whole plants, flowers, branches, leaves, and seeds. Specimens are attached to herbarium sheets with water-based glue that does not yellow with age. On average, 10,000 – 12,000 specimens are acquired by the RSA herbarium each year. Some specimens are collected by RSA botanists, some are donated by other individuals, and some are on loan from other institutions. This year RSA will acquire closer to 15,000 specimens because of the recent acquisition of the private collection of Dr. Robert F. Thorne, a former curator of the RSA herbarium. After herbarium specimens have been mounted, dried for a week, and all items securely attached, they are brought upstairs to the collection. The RSA herbarium occupies two complete floors. Here they are placed into cabinets for permanent storage. 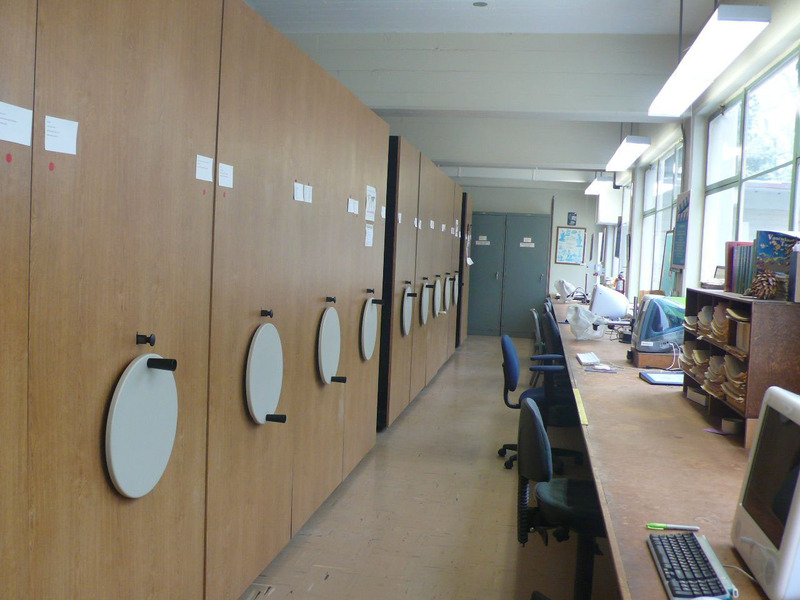 The herbarium’s more than 1 million specimens are arranged in a filing system of specially-designed cabinets. To maximize space, the cabinets line up next to each other the way the pleats of an accordion lineup next to each other. The cabinets slide and separate by turning the handles seen in this photo. 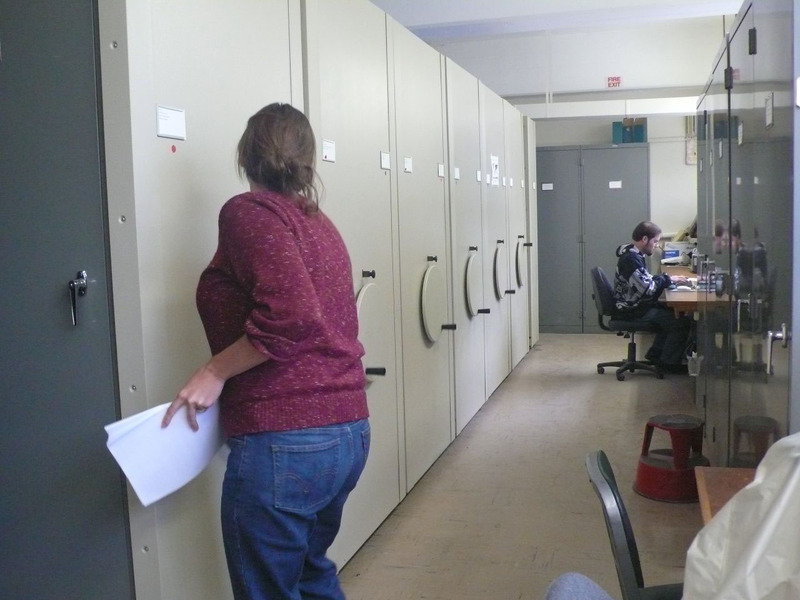 Open the door to one of the cabinets and you will find folders filled with mounted plant specimens. 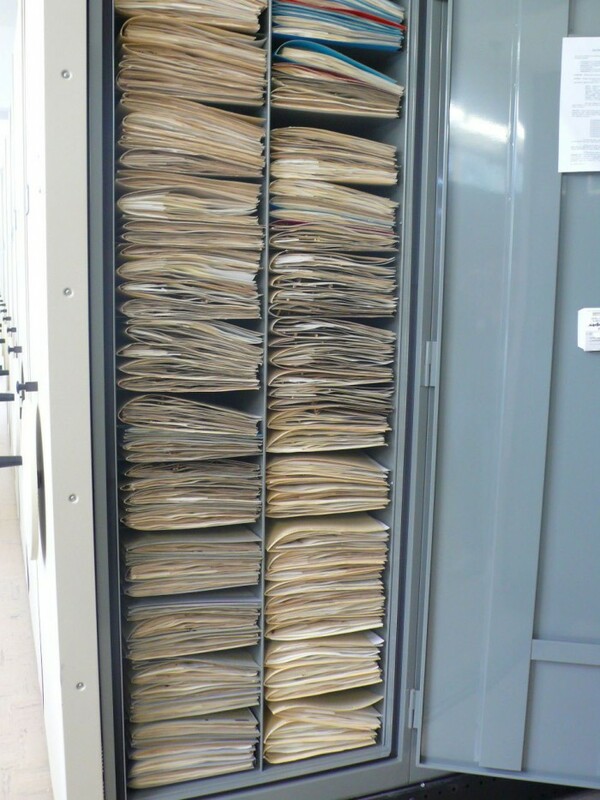 The large folders housing the herbarium sheets are called genus folders and they contain examples of species belonging to a given genus. For example, in the genus folder for Salvia, you might find mounted plant specimens of Salvia mellifera, Salvia nigra, etc. If you look at the genus folders located at the top of the cabinet, you’ll notice some of the folders are different colors. 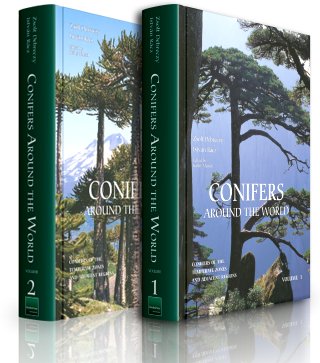 Genus folders are color-coded and each color represents a different region of the world. Many of the plants in the RSA collection were collected by RSA botanists. Botanists collect three specimens of each species. They keep one and trade the other two specimens. RSA has been collecting this way since the herbarium opened in 1927. There was a collecting boom in the 1930s and 1940s. Collecting dropped off in the 1950s, however. Through continuous collecting and the acquisition of personal collections, RSA has become the 10th largest herbarium in the United States. What happens with the specimens after they are added to the collection? Do they stay in a cabinet forever? Not exactly. Although it may seem this way. Herbarium specimens are viewed and studied by botanists, graduate students, and other researchers. Specimens are also loaned to other herbaria. Sometimes a botanist cannot find an herbarium specimen where she/he is conducting research and they have to borrow the specimen from a distant herbarium. Herbaria across the world have always worked cooperatively to aid researchers with their studies. The way herbaria work with each other is about to change as research facilities are using technology to their advantage. Soon researchers will no longer have to borrow specimens from distant herbaria. All they will have to do is go online to view the specimens they need. There is a huge scanning project underway and the RSA herbarium is helping to lead the way. The scanning project is a collaborative effort of institutions worldwide. It is part of a larger movement called the Global Plants Initiative (GPI) headed by the Andrew W. Mellon Foundation. The RSA herbarium is contributing to this effort thanks to a grant from the Foundation. Rancho Santa Ana Botanic Garden has been able to obtain a digital scanner and fund the digitizing of all the type specimens at RSA. Type specimens are the original specimens used to describe a new species. In addition to the scanning of RSA’s 6,500 specimens, the type specimens at The Huntington Library, Art Collections, and Botanical Gardens, the San Diego Museum of Natural History, Santa Barbara Botanic Garden, UC Riverside, and UC Santa Barbara are also being scanned. This means that RSA alone will be responsible for digitizing 10,000 type specimens. The objective of the GPI project is to digitize representations of the world’s flora and to make these digital images available for viewing. The scanning project will not be available online to the public until 2013. For this article, I met with Sula Vanderplank, Administrative Curator of the RSA herbarium, to learn about what goes on behind-the-scenes at the herbarium. During my visit, I had the opportunity to observe the scanning of one herbarium specimen. What a treat that was! The scanner used by the imaging team is much larger than the average office scanner, as it needs to accommodate herbarium sheets that are 12.5″ x 18″. Since dried plants are fragile and herbarium sheets cannot be placed face down on the scanner the same way a sheet of paper is normally placed onto a scanner, the scanner is the item that is inverted. The inverted scanner rests securely in place on a cart designed especially for the scanner. The scanner rests with the glass plate facing down. Herbarium sheets are placed on a platform and this platform is raised, thereby bringing the herbarium specimen to the scanner’s glass plate. The Scan button is clicked by the technician and the rest is magic. Each scan is 600 dpi and 200 MB. One scan takes 10 minutes to complete. The 10-minute scanning process includes the placement of the herbarium sheet, the actual scanning of a specimen, and the cataloging of an image. The imaging team can comfortably scan five specimens per hour. If you have an image in your head right now about what a scanned herbarium sheet might look like, magnify the clarity of your vision by 10. The images created by the imaging team are crystal clear. The tiniest detail can be observed and when zoomed in upon, details can be viewed in an even more mind-blowing way. These herbarium images from Kew Botanic Gardens do not match what I saw in person, but they will give you an idea of what an herbarium scan looks like. Some of the images created by the RSA imaging team can be purchased in the garden’s gift shop. These images are of herbarium specimens of plants growing on the grounds at RSA. These images have been carefully mounted using archival materials and framed behind glass that protects the specimens from sunlight. The Global Plants Initiative will not only open the world’s herbaria to researchers, but introduce the public to the diversity of plants on our planet. Are you interested in learning more about how an herbarium works and how to create herbarium specimens? Then you might be interested in a special herbarium class taught by Sula and other key members of the herbarium staff. This class is offered only a couple times per year, so check the Rancho Santa Ana Botanic Garden Calendar regularly. The Rancho Santa Ana Botanical Garden has a longstanding relationship with teachers and schools in southern California. School groups tour the garden and the herbarium during the school year. The herbarium has a special show-n-tell collection comprised of mounted plant specimens, one of the them having been collected by explorer Captain James Cook himself. To learn more about docent-led tours for K-12 students, college classes, youth groups, and adult community groups, visit the RSABG website. Would you like to take the herbarium class at Rancho Santa Ana Botanic Garden? If so, please add your name to an Interest List for this class. April 2014 – Links to the RSABG website have been updated. The original link to ArtPlantae Books has been removed. This is a great article – clear and informative. I’ve looked at some of the herbarium pages at RSABG and they’re quite beautiful. Also, for a special project, they sent me their scan of a type specimen which took almost a half hour to download! A huge, high resolution tiff file that does, indeed, show every spec of dust on the page. Amazing. The Global Plants Initiative (GPI) is truly an important project.